4.The buttonholed double chain stitch is combined with- buttonhole stitch and detached chain stitches in the first row. 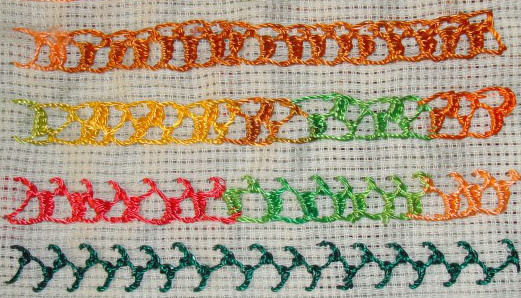 Stem stitch and chain stitch are worked as borders in the second row. 5.Cretan stitch is worked over the buttonholed double chain in the first row, and French knots are worked in the spaces in the second row. 6.The last row is whipped with variegated rimjim thread. 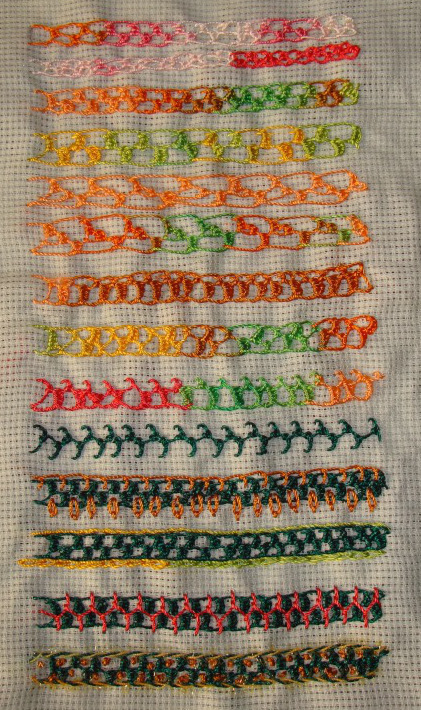 This stitch sampler was more of a practice piece, than a reference for this stitch. I am content of learning a new stitch which was missed during the earlier TAST challenge. Still on the catching up mode of the TAST stitches of five weeks, I am working on 69th week’s stitch of the TAST 2013 Challenge by SharonB. It is hard to maintain the uniformity of the stitches. The rows of this sampler do not look neat at all. 1.I tried familiarizing this stitch in this part of the sampler. 2.After working this stitch broader in the first row, I tried vainly working this stitch in three steps. 3.The height of the stitches are varied in the first two samples, the top part is short in the first row, and alternate two stitches are worked with single buttonhole in the second row. buttonhole stitches on open chain stitches on one side of the third row. Single buttonhole stitches are worked on open double chain stitches in the fourth row. This row looks like knotted feather stitch, though!